Welcome to Project 2 in our Gardening with Preschoolers series. This month, Andrew from Quickcrop.ie explains how easy it is and, even better, how easy it is to involve your preschooler in growing carrots with this simple project! You don’t even need a big plot or garden! If you ask a child to name a vegetable I’ll bet carrot will come up 9 times out of 10. It’s almost famous having appeared as a sidekick to bugs bunny since the 1930’s and is one of the top crops kids seem to want to grow. Carrots are one of the richest source of vitamin A in human nutrition. What does it do? It gives you night vision goggles! Vitamin A is needed by the retina of the eye to form a special light absorbing molecule that is necessary for night and colour vision so the next time you stub your toe on the corner of the bed putting the cat out you’ll know what you should have had for dinner! Interestingly the Royal Air Force in Britain are also responsible for highlighting the benefits of Vitamin A. During the war British pilots were having a better than average track record for shooting down German planes at night because of their secret new radar technology. To try to hide the radar system the RAF circulated stories of their pilots carrot consumption to put the Germans off the scent. Sounds bizarre but is quite true! Too much manure or fertilizer. You won’t need to worry about 2 of these as we’re going to grow in our funky orange carrot planters using compost instead of soil. Of course you can grow carrots in any container you wish, I have seen great crops grown in buckets, just remember to make a few holes in the bottom for drainage. 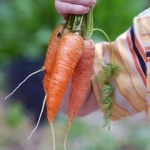 You don’t want too much nutrition in the soil when growing carrots or the roots will be forked and misshapen, this is because the roots will try to seek out the nutrients. We’re using a standard multi purpose compost here which is ideal. Step 1: Fill the carrot patio planter using one 60 litre bag of compost. The planter is not heavy so can be easily moved around when filled. Step 2: Make 2 furrows or ‘drills’ in the compost about 2cm deep with your hand. The drills should be approx 15cm apart. Step 3: Sow your carrot seeds. 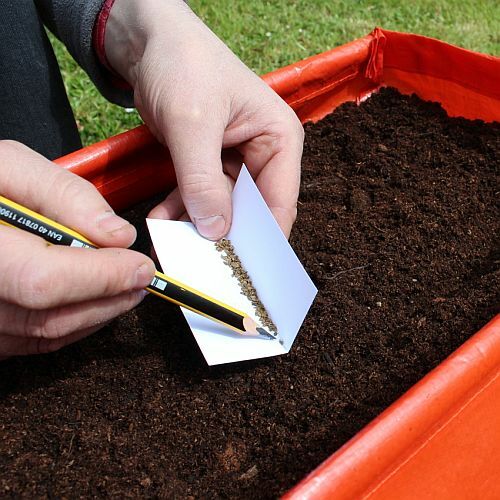 The seeds are quite small so a good trick is to use a folder piece of stiff paper and a sharp pencil. You will see the seeds line up obediently in the crease of the paper where they can be pushed over the edge as you need them. Use a pencil rather than a ballpoint as small seeds can stick to the ink on a pen. You’ll also find this is an excellent way to sow all small seeds. You want to sow them to a spacing of about 3-4 cm between seeds. Be as accurate as you can as thinning them out later can attract the most common carrot pest, the carrot root fly. Step 4: Cover the seeds and water. 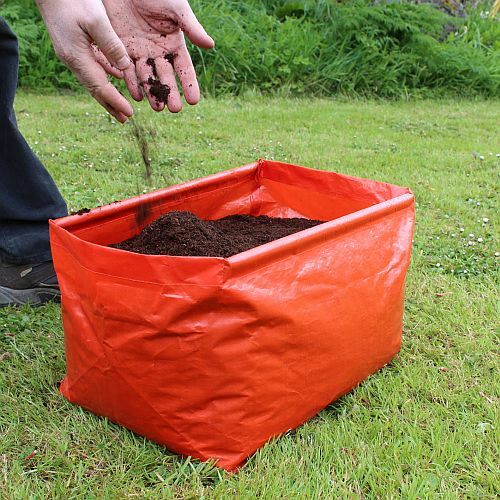 Keep the compost moist and don’t let it dry out for long periods. Carrots left to dry and then watered can be prone to splitting. Step 5: Move to sunny spot in the garden. Most vegetables need as much light as possible to produce the best crops. That’s it. It’s really very easy. I’ll be showing you how to thin carrots in a later bulletin but for now keep them moist and sit back and wait for them to pop their first green shoots up above the soil. They will take about 2 weeks to germinate so don’t worry if nothing happens for a couple of weeks. Remember you can watch our carrot video tutorial if you get stuck with top organic growing lecturer Klaus Laitenberger. You should have baby carrots by June. If the planters need to be taken home for the holidays they are very easily moved by lifting the sturdy side bars on the planter. I hope you enjoy this one, wait till you see the excitement when they pull their first bunch of homegrown carrots, it’ll be fun! Don’t forget the Quickcrop website has a very comprehensive learning section. It’s all free to use so make sure you visit the site if you need any help. We’re also delighted to take your phone calls or answer your emails so do get in touch if you have any queries. Quickcrop is an Irish website dedicated to the vegetable grower. They provide a wide range of products including timber raised beds, soil mixes, vegetable plants, tools and accessories. They have an extensive free knowledge section with free video tutorials as well as a unique online schools app.